Let Air Solitaire take you on a relaxing flight! This classic solitaire game even lets you unlock new soothing songs and beautiful backgrounds that make your experience truly first-class. 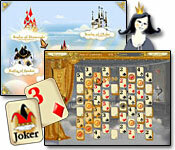 Match cards according to alternating suit colors as you coast towards the horizon and your next solitaire game. 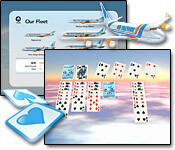 Unlock new airplanes with their own difficulty levels, and become a Frequent Flyer on Air Solitaire!